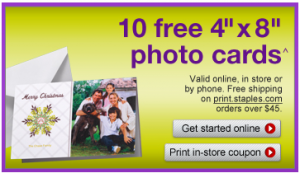 Use this coupon to get a free set of 10 4×8 Photo Cards at Staples. This is a great way to get your holiday cards started! Expires 11/12. Thanks Brainy Buyer.